I love pumpkin pie recipes! You may recognize this squash as a fall treat however pumpkin is a versatile squash that has so many delicious an easy recipes that can be enjoyed year round. Traditionally this pie recipe is made with egg and sweetened condensed or evaporated milk. However if you have allergies to eggs or milk you can use those ingredients. Luckily it is very easy to create a delicious and allergy safe alternative recipe without those allergens, and best of all you can still enjoy that wonderful pumpkin pie taste! Below we have two delicious and easy recipes that you can enjoy this fall or year round if you want! If you are looking for a quick snack, dessert recipes or perhaps a healthier pie recipe you will love the below pumpkin pudding recipes. This flour free and crust less pudding pie is also packed with chia seeds an amazing super food! 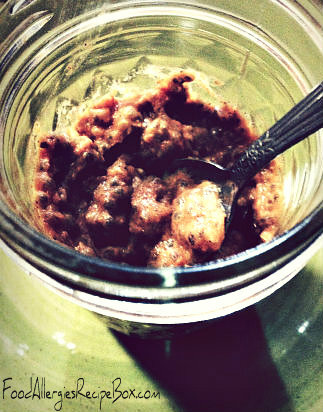 Chia seed recipes are a great way to add extra nutrients into your meal, and chia works as an egg re-placer. For those coffee fanatics out there, me included, we also have delicious smoothie recipes for you to enjoy! Looking for more ways to enjoy this orange squash? Try this tasty wheat and gluten free muffin recipe using this fall squash. Combine all ingredients in a bowl and mix together. Divide into two small cups and enjoy. Have you ever tried Rice or Coconut whip cream? Remember to check the food allergy label on these alternative whip creams to see if they are safe for your family to eat. Simply add a dollop of whip cream if desired (some stores carry a brand made with rice milk) and sprinkle the top with cinnamon, I hope you enjoy this delicious and allergy safe pudding recipe! What's your favorite fall recipe? Share with us on Facebook and join our online community! Start by brewing a cup of your favorite coffee. Combine all ingredients along with your freshly brewed coffee, into a blender. Pulse ingredients until well blended. Pour into your two favorite cups. 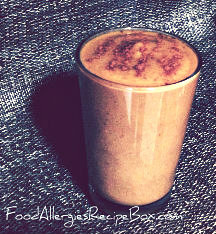 Now time to enjoy this easy and delicious pumpkin smoothie recipe! Return from Pumpkin Pie Recipes to Food Allergies Home Page!